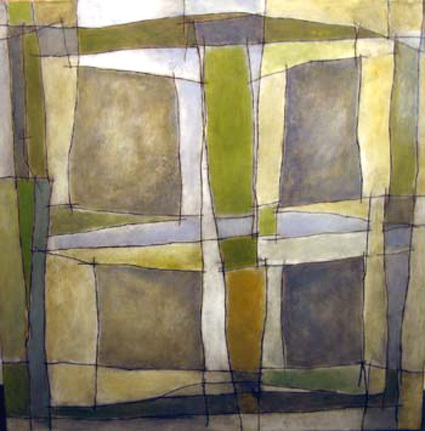 Window, oil on linen, 44" x 44"
Scott Charles Ross, a Waterloo, Iowa native, received a B.A. from Grinnell College and has done graduate work at Iowa State University and Drake University. He has completed several private commissions throughout the country and abroad. Scott had a solo show at the newly renovated Marshall Fields store in Chicago and his work is part of Grinnell College's permanent art collection. Ross's paintings are grounded in both abstract and figurative forms. He is inspired by the people and travels of his life as well as his environment. He writes, "Merging concrete visual elements with inner observations, I intend to transfer abstractions into a perceived reality for the viewer." Scott's process involves many layers of charcoal, oil paint, wax and glazes, which results in a painting with a hard and glossy surface with much texture underneath. The paintings are produced on linen and stretched over wood panels.